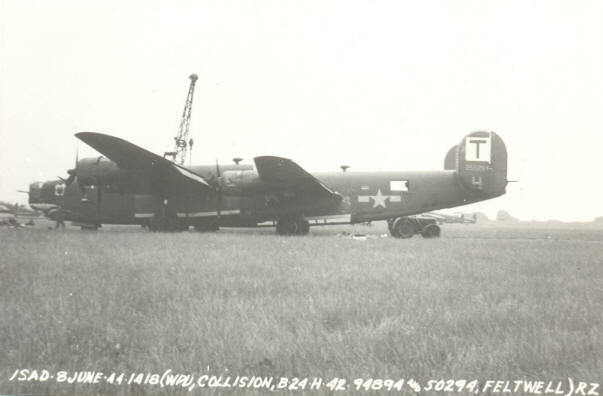 On the 7th June 1944 two B-24 Liberators of the US 490th Bomb Group based at Eye, suffered a ground collision at RAF Feltwell. 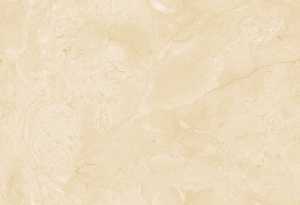 I am very grateful to Mr Eric Swain for providing the background information for this story. This account was written in 1998 by Jim Cunningham the Co-pilot in Lt Brown’s aircraft, which had been named “Flying Ginny”. 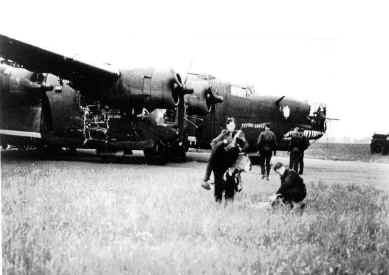 We got back to the base at about noon of the sixth after our D-Day mission. Needless to say, we were dead tired and after putting our equipment away and doing all the various things that must be done after a mission it was about it was about 2:30 PM. Of course we had no sleep the previous night and went to bed as soon as we could and slept clear through until the next morning. We figured we would go on another mission that day but we weren’t sure when. Apparently the staff didn’t know either so we had to go to the briefing room and stand by until the received the battle order from headquarters. It finally came at about 2:30pm (June 7th). We were briefed on the target for over half an hour and had to take off at 4:00pm. This did not give us much time but we made the take off time OK. The primary target was a railroad bridge at Tours, France and if we could not bomb that then it was to be the bridge at Nantes. 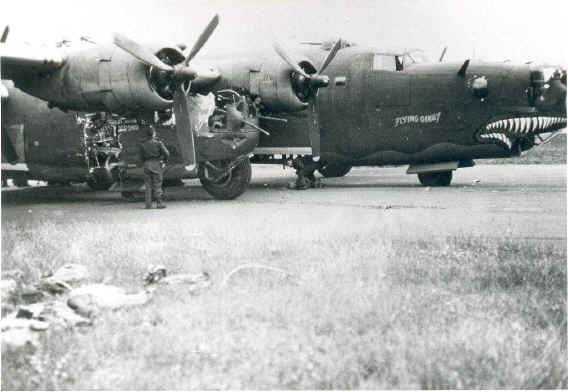 We had complete overcast at Tours but there was a hole in the cloud at Nantes and got our bombs off there. They were right on the target. That sure gave us a good feeling, especially after our problems on D-Day. 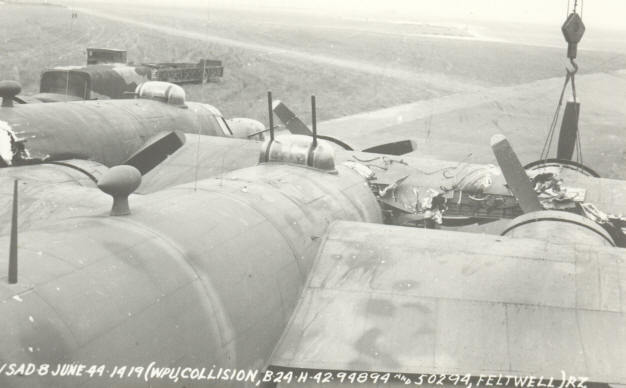 The flak was certainly heavy and accurate around both of those targets. The bottom of our plane looked like a sieve but luckily no severe damage and no injuries. The mission was a success, but it was by no means over for us. It was about 11:30pm when we returned to the base area and found that there were enemy fighters waiting to shoot us down as we approached to land. We received orders to fly west and land at the first field we could find that was a reasonable distance from here. 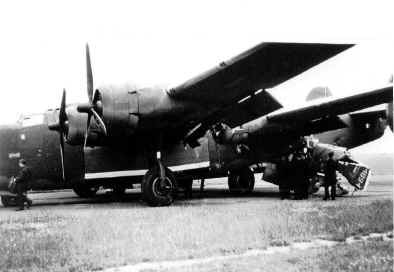 We were very low on gas and weren’t anxious to make another single engined landing, especially at night. Another thing on our minds was the “Q” sites that had been set up to look like airfields to fool the enemy. At night these looked like lit runways but in reality they were dumps meant to wreck an enemy plane attempting to land. 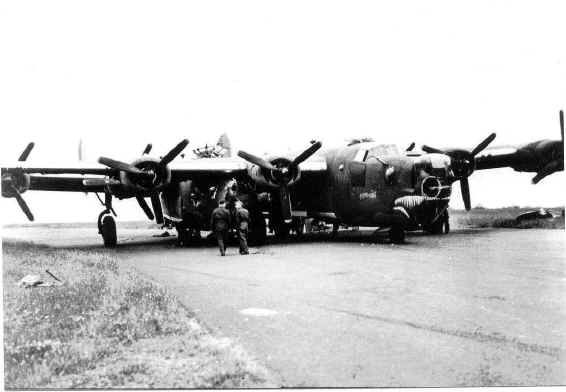 We were fortunate that the runway we picked was an RAF field with a grass runway, which made the landing pretty rough, but it wasn’t a “Q” site and we got down without a problem. 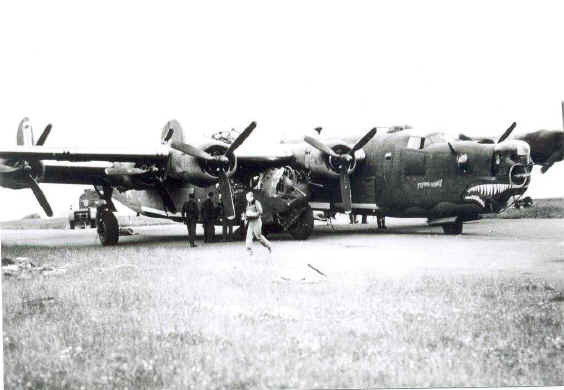 As soon as we got off the end of the runway, Lt Brown sent Cooper out to guide us off, (it was pitch black out there). 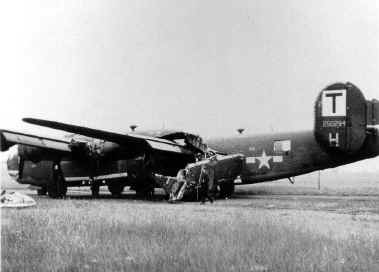 We had no way of knowing, but Lt. Heath had landed just behind us and just as we were starting to taxi we heard and felt a terrific crash. 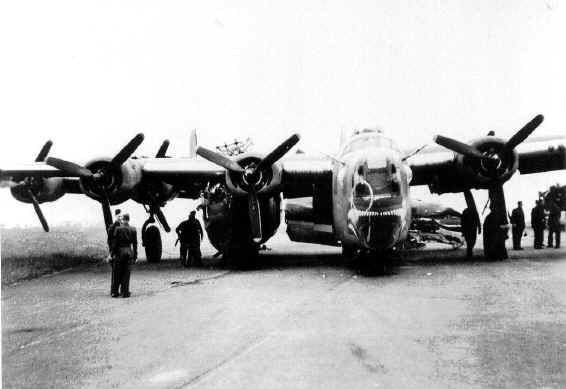 Heath’s plane, (Named Madam Shoo Shoo), ploughed through ours and the nose ended up between our number 3 and 4 engines. Lt. Brown ordered everyone out and we didn’t stick around to talk thing over. I fully expected an explosion. I cut the switches and got out of my seat the fastest ever. The crew gathered on the runway, all except Brown, Robarge and Meek. Bill Brown stayed in the plane to check on the crew and found Robage and Meek pinned in the wreckage. There was no explosion or fire and we got the two men out in about 15 minutes, all cut and bleeding. The RAF people were soon on hand and got them to their hospital. Robarge had a sprained shoulder and cuts to his face. Meek had a broken hand, broken pelvis and cuts on his face and eye. Lt. Heath and his co-pilot Lt. Simpson were pinned in their plane for a while, but the RAF people were on hand right away to help them out. Both planes were a complete wreck and it’s a miracle that we weren’t all killed. We spent the night at the RAF base and were treated royally. We didn’t get much sleep, but we were pleasantly surprised in the morning by being awakened by an RAF enlisted man with a cup of delicious tea! After a meal at the base and some pleasant conversation with our RAF counterparts, we returned to our base at Eye. This had been our fourth mission. Additional Notes;- Jim Cunninghan managed to keep the 8 day, cockpit clock from “Flying Ginny” he passed it on to Eric Swain. F/LT “Jock” Duncan, a senior instructor with No. 3LFS (Feltwell) managed to obtain the clock from “Madam Shoo Shoo” and has passed it on to John Reid, a good friend of mine. Both clocks are still in England and are still ticking after all these years! 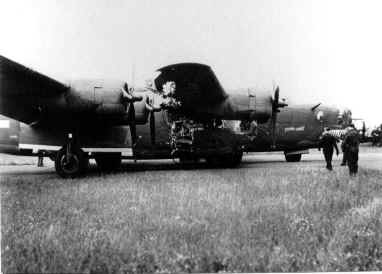 Copyright for the account written by James Cunningham and the photographs is owned by Mr Eric Swain of the 490th Bomb Group Association. Permission given for use in the magazine and on the website. The two right-hand photos are "US Official". Permission given for use in the magazine and on the website.